Something that I’m always hugely conscious of is dark circles under my eyes – with our busy lifestyles, travel and lack of sleep, dark circles around the eyes are the number one beauty concern for many girls. We all know that drinking more water and getting enough sleep are the best things we can do to prevent them, but it’s hard to always keep on top of that, so the delicate skin around the eyes needs something gentle yet powerful to give the illusion of a perfect night’s sleep! 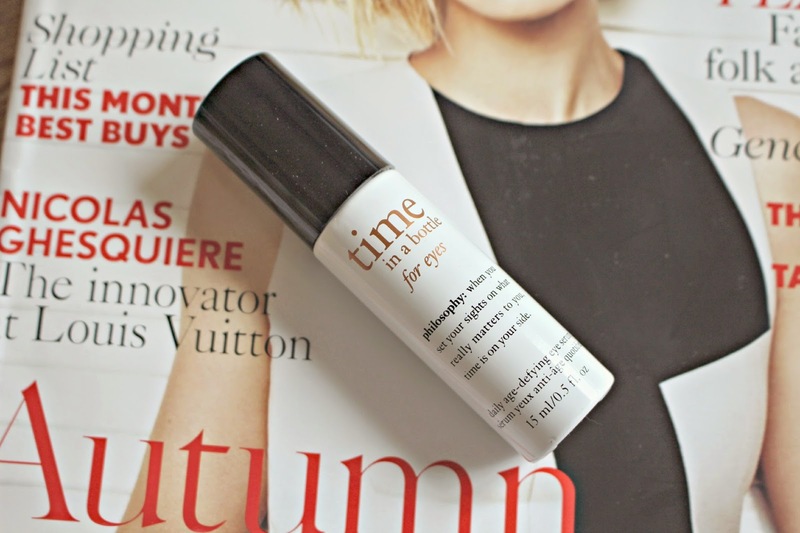 Philosophy’s Time in a Bottle age defying serum for eyes is a powerful gel-like formula which works to prevent damage caused by the environment. I often find it hard to review skincare products like this as it takes a long time to see any proper results (if ever!) but when I apply Time In a Bottle, my eye area looks instantly brighter, and feels tighter. Like an Espresso for my eyes, my face looks more awake, the whole eye area feels revitalised. Long term, Philosophy promise that the DNA renewal complex within the serum promotes the skins natural renewal process also protects against daily damage. I use serum after cleansing and toning, patting it around the eye contour area. I then apply my moisturiser and immediately after, I apply my makeup. The serum sinks in quickly so I don’t have to wait around before the next stage of my daily routine. After using the serum for a couple of weeks, my eye area looks more rested, and the ingredients are hopefully working to give anti-aging benefits to the delicate area – here’s hoping! Time in a Bottle for Eyes is £36 and you can buy it direct from Philosophy here.